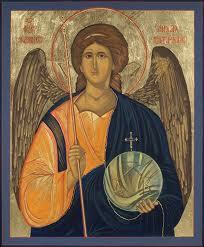 Holy Archangel, Michael, be my companion this day, a guardian and protector along the way. Defend me from the evil one. Stay with me in the day of battle. Pray for me, Michael, you who are well pleasing to God. Pray for me that I may know the mercy and salvation of Christ. Ye watchers and ye holy ones, Bright seraphs, cherubim, and thrones, Raise the glad strain, alleluia! Cry out, dominions, princedoms, powers, Virtues, archangels, angels’ choirs, Alleluia! alleluia! alleluia! Alleluia! alleluia!